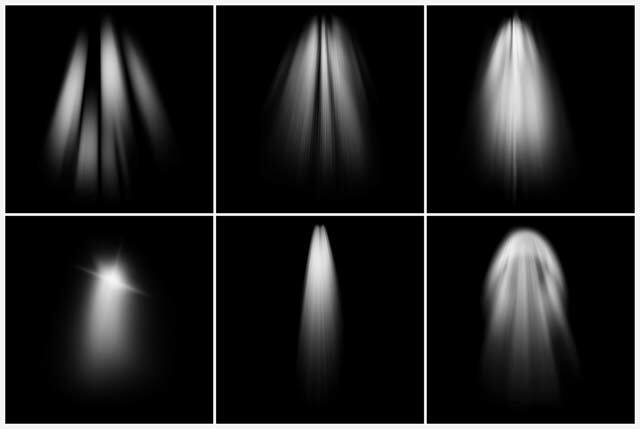 This weeks Friday Freebie is a set of Photoshop Brushes that create amazing beams of light at the click of a mouse. If you’re wondering why there are two versions, maximum brush sizes in Photoshop CS6 (and in Photoshop CC) are twice as big as CS5 and earlier. To take advantage of this I’ve created two sizes of brush… be sure and download the correct one. The brushes are copyright Gavin Hoey 2013. Use is limited to any personal, non-commercial purposes. Please share the Friday Freebie by linking back to this page. Do not redistribute the original image without my permission. I love that picture with the light ray coming through the church window, Gavin. Is there a work round for these brushes in Elements 11? Well on one thank you to Gavin for his brushes, I think that at every time I shall make photos in a church I shall use them discreetly, I made tries also for undergrowth by colouring in them in various greens, Fantasy there is certainly others use which I am going to discover. Gavin, your Friday Freebies are wonderful. Always well done and really useful. Thank you and keep up the fantastic work. Wow…thanks so much Gavin. I appreciate it. Muchas gracias por su aportación, un saludo. Fantastic brushes! Already used one to great effect. Love it. Thank you! Just great. Works perfectly and looks really great! Thank you very much Gavin. Muchas gracias! Saludos desde México. Te esperamos algún día por México? Sería genial verte en vivo. Un abrazo. En México se celebra el Día del Maestro en mayo 15, debo felicitarte entonces, debido a que, sin que lo sepas, eres mi maestro de fotografía! Can’t for the life of me get this to work on elements 11. How do you save the brush? Thank you so much for sharing these brushes with us. What used to be a little difficult is now so easy. I have used them with great success. Thank you Gavin for the nice brushes and greetings from Hungary! HO HO!!! Great brushes Gavin….I mean seriously…brilliant. cheers Gavin … this is my first attempt at using your “light ray brushes” a little more experimenting with them I think, but not to bad for a first try. Gav, I downloaded the Light Ray Brush app to my Windows hard drive and my Elements 11 opened up. Is the app automaticaly in Elements 11 and if so, where is it located to open it? Or is there another step that I need to do? As you can tell, I’m new to this whole thing. Gavin, you are an amazing photographer ! Thank you for sharing this ! Thank you, Gavin! I learn so much from your videos that I go back over them numerous times. Thanks also for the brushes! These brushes look like exactly what I need but being a relative novice at Photoshop can the color of the brushes be changed ? Thank you for the great Brushes, This will save me a ton of time whenever I need Sun Rays in my photo. I never seem to get them the way I want when I create my own rays. Thanks for the brushes Gavin.. Thanks for all your tutorials ..
As one of your hundreds of thousands admirers, I have followed you and your work for a several years now. Your photography and Photoshop (and Elements) videos/tutorials have really helped to improve my skills. Thank you!!! Below is a link to a picture I recently took at a local restaurant here in Houston, TX with my small and very versatile Canon Power Shot S100 sub-compact camera. I edited it in Elements 11 and used two of your Light Ray files to enhance the light streaming in the window. I’m sure I will use your ingenious “rays” many times in the future!! Further on my recent post today. Not sure if you can open the .psd file in Drop Box so here is another link with a jpeg picture of Bell’s Salt and Pepper shakers and Light Rays streaming in the background window. I d/l the light ray brushes, followed your instructions for installing and cannot seem to find the brushes in the brush pallet. Any suggestions. In the light of the morning I found the brushes. I tried them but all I get is a black streak. Any instruction on how to use them would be appreciated. I tried a blank layer above and then filled with white but nothing. Thank you for your quick reply; it is appreciated. I was did set the foreground color to white, as you suggested. It is still painting black…I’m sure I am doing soemthjing wrong. The blend mode is set to linear light (although I did try other blend modes). Your assistance is again requested. Thank you, in advance. Gavin: I really thank you for your patience with a relative newbie. Using a Normal blend mode on both does work but I cnnot see a major difference even at 100% opacity. I will play with it using a different photo tomorrow. Again, any advice is certainly welcomed. I started watching you video tutorials on Adorama and jsut love what you do. When I click the download links, they take me to a adobe cloud webpage that says Page can’t be found. Are these no longer available? Not sure what the problem was but it all seems to be working now. These are fantastic! Thank you. How do you rotate them? The easiest way is to add the light rays to a blank layer, press CTRL+T and rotate them with free transform. To avoid loosing the fine detail at the edges, start with the light ray in the centre of the image and free transform it into position. I downloaded these brushes in to CS6. But, I do not know how to apply them to a photo. Any chance that you can send me some step-by-step instructions? Or a short video wold be fantastic. I love your videos. They worked perfect in PS CS5. Thanks a lot from Uruguay!! I finally cracked my inability to download from your creative cloud using W7 & IEv9 – I turned off the ‘Do not save encrypted files to disk’ option in IEv9 and can now access all your Friday Freebies. 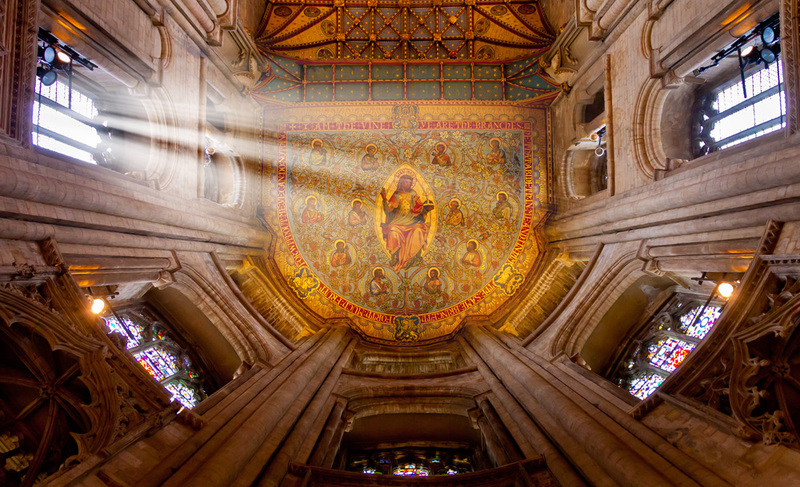 You arsked for links to images making use of the freebi so here is a link to a recent interior panorama I did of Horsham Parish Church and just added the light rays courtesy of your Light Ray brushes. Thanks for your tutorials & Friday Freebies. I was able to download the light brushes into CS6 on my computer. But, I can’t figure out how I am supposed to use them. If you (or anyone else) can give me a quick lesson on how to use/apply these brushes, I would be appreciative. Bring up the “Brush Panel” (icon looks like a miniature folder with 3 brushes sticking up out of it – mine’s located both at the top of the screen to the right of the brush shape selector, and also to the right of the screen in a collapsible panel). In there, under the “Brush” tab, you’ll see a circle with a cross through it, rather like a compass pointer. Rotating this changes the direction that the brush points in. Are these brushes no longer available? When I click the link it goes to a blank page. Gavin, a link to an autumn image using your light brushes; many thanks. I love all your web sites and I have learned a lot about photoshop from your tutorials and I have used many of your techniques. Keep up the good work. Ways every level user understands..
You love what you do and it shows I hope some day in the future I can share my limited knowledge with you. Here is another one. Really great!! I tried to download this for PS 5, I am then taken to the cloud page and “loading” is stated but nothing happens? Thank you! I just love your work and learn so much from watching your videos. I have installed the zip file on brushes, however when I apply a brush opacity is very high, I mean they apply very soft, almost transparent, even with opacity of layer @ 100%. Is there any option to apply them with less transparency? I have always shied away from Photoshop for its complexity, but you make your videos easy to understand and I appreciate that. That you for these brushes, I will be using them on future sessions. Could you please explain how to install that resource in Photoshop CC? I once signed up for a trial of Adobe CC, but decided not to use it (I already had PS5 and LR5). Despite having uninstalled it, every time I try to open your download it assumes I’m still using CC and tells me my trial has expired, and refuses to go any further. I don’t want to use my “CC trial” version – any thoughts on how I can make it use PS5 instead? Thanks for making these brushes available. From the moment I saw them I knew exactly where I would use them. The combination of natural light and these brushes really helped my image. Thanks for the assit Gavin! Gavin…you are my favorite Photographer / Personality! Love your work. Your videos are really a “Bar Above”. Thanks for the Light Rays, they are so neat. (1960’s word) Thanks again. just a quick side note. If I were to use any of your Friday freebie brushes in my workflow and then sell the end product to clients. A) Is that allowed? and B) do you require a cut? Great brushes!! Much easier to create the sunrays than other solutions. Light rays – You state for personal use and non-commercial, does this mean I am unable to sell my pictures using this plug in effect? hi ,is this available for lr5 ? They’re for Photoshop and Photoshop Elements only. Here is my use of your Light Ray Brushes Mr. Hoey…. Thank you so much. This was my son in this shoot so its not for profit. Enjoyed your Red Riding Hood Tutorial. Thank you! Unfortunately when I click on the link to download the CS6 brushes I get this message: Sorry, this link is no longer active. Am I doing something wrong? Hi Gavin do you do presets for LR 6? thank you Gavin, Im new to photoshop, just 7 months into it, and appreciate the help for my hobby. Hi Gavin, I loaded the Light Ray Brushes but they do not show up in the brush tool panel. I’m using Photoshop CC 2015 for Mac. After several attempts, the brushes finally loaded. Thanks so much, they work great. are the brushes comparable with mac? probably the best way to explain my question was to said if the brushes can be rotated. When i try to unzip the file I get an error message about broken pipes and then cannot install them. Any ideas? No idea, a question for Google perhaps? I just tried to download the light ray brush,brought to the cloud but all there is a white screen nothing there help> Can we still get them? Try again, the Adobe hosted download page is usually very reliable but can go odd from time to time. Great brushes very useful many thanks. Hi Gav, really nice video – esp. at the end. What model Dell do you use? I’ve seen and used a few but not happy with them. Hey, Gavin! Thank you for your helpful tutorial on balancing flash with ambient light and for the free Light Ray Brushes. I am not sure what I am doing wrong, but after downloading the preset and finding it in my brushes, when I click on it on the layer, it does “let go” and stay on the image. Any thoughts? I would greatly appreciate it. hi. Gravin is it possible to take light brush in lightroom environment…. Lightroom doesn’t have “brushes” in the same way Photoshop does, so sadly no. I downloaded ‘light brushes’, THANK YOU. I did follow an instruction on how to install it, no problem. However, how I will know which brushes are those which I downloaded from your site and which are part of PS? Thank you for your prompt reply. The name of the brush appears when the mouse pointer is above them and I found 6 light brushes from you, is it right? Gavin thanks a lot for the brushes, and your videos are awesome. I am from India, learning thru your videos, thank you once again. Thanks Gavin!! Used these light brushes in this picture taken in the Anglican Cathedral in Liverpool. Hi James. The light rays are only brushes and can’t mess with Photoshop. You can delete them by right clicking each brush thumbnail and choosing delete or by going to Preset Manager and deleting from there. Thank you! I love learning new things! Excelente Gavin!! ; Gracias por el aporte. un abrazo dondequiera que te encuentres. thank you very much! Your tutorials are great! I extracted the files and I can still not get them into Photoshop CC. It says its not the right kind of document. Am I doing something wrong? Thank you so much – these are awesome! Big thank you to Gavin for making these freebies and allowing us to experiment and use them: such a kind and talented photographer, cheers. Late afternoon stroll today close to home and motivated to try a multi-image pano in Lightroom. Thought the light-ray brushes might add the finishing touch but decided to keep it subtle so moderate opacity applied. Thank you very much for your free Light-Ray brushes. It works like magic! How do you rotate the rays once you have placed them on your photo? Love this plugin, I am able to add some special effects to my suns wedding photos. Have been a great admirer of Gavin for some years, back In the day of Digital Photo I learn’t so much. Thank you. Have a question but only just registered so not sure where I can ask at this point.. Thanks, Gavin, these and the Fog brushes are great! Much appreciated. Thank you…. these are spectacular!!!! Thank you Gavin for your tutorials , inspiration and all you do! Gavin, I absolutely love your videos. Your teaching methods are clear, to the point, and easy to understand. Thanks to modern technology we here in the United States are fortunate to have you at our disposal. You are simply amazing at what you do. I still do not own photoshop. In all honesty I tried taking a class at our local college only to leave just as confused as ever. Watching your videos has taken away those huge fears of photoshop. No longer terrified of this nemesis, my plans are to save and purchase photoshop. Thank you Gavin Hoey for all of your wisdom. Gavin! I’m still using these in 2018. Beautiful brushes amigo. How can I repay you?! Great post about light ray brushes. Thanks for sharing with us. I love these brushes. You can also use them in reverse, painting shadow streaks onto an image.